Following the news of pricing changes, Netflix has taken a sharp hit in favor among consumers, falling from the top spot to the bottom spot among video rental services. 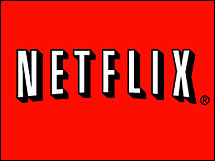 Netflix was the undisputed leader in positive consumer perception with a Buzz score of 39.1 on July 12, compared to the next ranked score of 12.6 by Redbox. After the pricing changes, Netflix dropped to -14.1, and is now at -6. This is a statistical tie with Blockbuster. 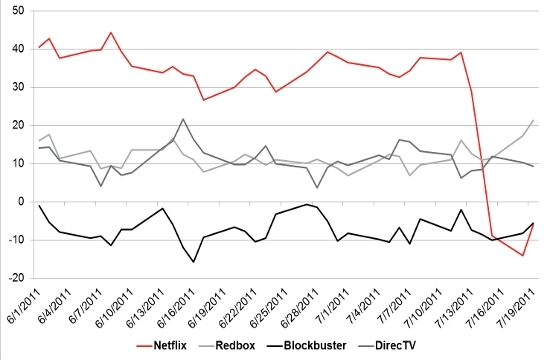 Redbox moved up in favor, increasing to 21.3. No surprise there, I think everyone is pissed at their ridiculously large rate hikes. I will most likely cancel my subscription, at least temporarily, in protest. Not sure if I’ll subscribe to just streaming or just DVD in the future, I’ll have to weigh the options. In the meantime, I’m just pissed at the rate hikes!